Однако сегодня мы имеем удивительный курьез, который после некоторых раздумий был все же признан убедительным для опробования нового амплуа. Ну да, давайте по порядку. Некоторое время назад у меня на блоге проходила очередная интересная вариация черного Манхэттена, под названием Prospector. Я еще в посте отметил, что название, конечно, вообще неоригинальное и по большому счету проспекторов всяких пруд пруди. И конечно, пытаясь по своему обыкновению нагуглить пару фактов я наткнулся на кучу одноименных коктейлей, один из которых был найден на SeriousEats.com в статье глубокоуважаемого Пола Кларка. Статья была прочитана по диагонали, с внимательностью не более, чем необходимой для понимания, что это не предмет поиска, но коктейль сразу запомнился. The topic of S.I.P.#18 is Punch! As a matter of fact this topic runs contrary to our common rule with which we usually choose the exact cocktail for our collective exploring and sharing of opinions. This topic is an absolutely different case. It’s clear that punch is quite a wide thing, and it seems almost impossible to get an agreement in choices of even a couple of participants. However, despite having some experience in individual punches like Gin Punch, Knickerbocker Punch, Pisco Punch, or Ti’ Punch, I decided to try something real. I decided to prepare something that I can really share with my friends. And that statement of question turned out a true challenge for me. You know, it is not so easy to mix up big punches not at the big party but in a quiet workroom. 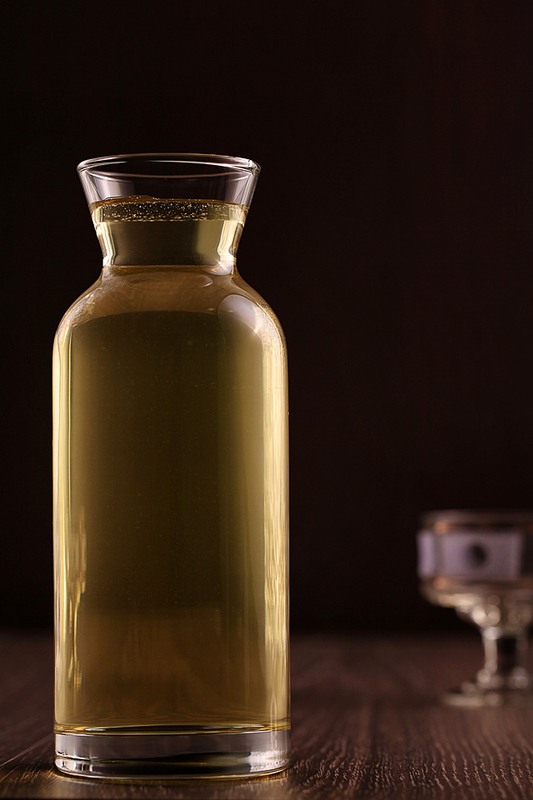 Certainly, it is no problem to prepare the drink, but utilizing it becomes a serious problem. In spite of having a hobby in cocktail mixing, I drink really not very much, my wife drinks far less, but if I invite an appropriate crowd of friends, I, perhaps, won’t be able to have enough time for photographing and describing. It take quite a different mood to throw a party or create a post. But even so I could find a solution! For the S.I.P.#18 – Punch! I picked out an absolutely unique punch – very old [it is said to have been created by the famous English playwright of the Restoration Aphra Behn], noble [created in English high-society and printed, specifically, in the first cocktail chrestomathy – How to Mix Drinks, or Bon-Vivants Companion by Jerry Thomas], absolutely the weirdest [it contains milk but it is pretty clear, isn’t it weird? ], and very popular in modern American cocktail geek circles, drink. Going by, lets me say, a mixoshpere, it looks like this punch have been gathering popularity for last year or two. 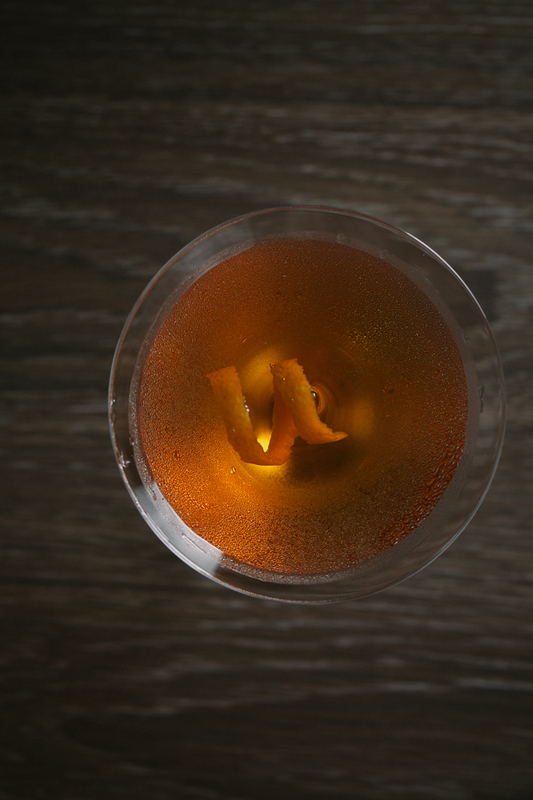 Esquire experts gave it a ‘Cocktail of the Year’ badge in 2014. It can really excite. For making an acquaintance I used a recipe from the aforementioned Thomas’ first book. Obviously I had to make some unessential changes, for example, I converted the recipe to metric units and slightly scaled it. Peel a middle sized lemon trying to avoid white pith underneath. Put the lemon rind into an appropriate saucepan and add about 2/3 of the sugar, rub thoroughly with a muddler. Then add sliced pineapple, spices, and muddle. Add the other ingredients except milk. The boiled water should be added last. Briskly stir for dissolving of the sugar and close tight. Let the mix steep at least 6 hours in a cold place. After steeping, add hot milk and 40 ml of fresh pressed lemon juice. In this very moment milk must curl. Filter through filter paper / jelly-bag / cheesecloth or something like this. The drink must be quite clear, if you can’t filter, try to settle the punch. Strained punch must be refrigerated before serving. Serve straight up. This recipe is about for 1 liter of the punch. As I decided to try this historical recipe of the English Punch I had to read some historical surveys (actually it was only Punch by D. Wondrich and the excellent post about this punch by Adam Elmegirab on the blog called The Jerry Thomas Project) for picking out the rest of the ingredients. As a result I decided to use a composition of Meukow VS Cognac [young, relatively pungent and lively spirit, 80 proof], Rhum J.M. V.S.O.P. [86 proof], Rum Mount Gay Black Barrel [86 proof] and a pungent, over-proof Lemon Hart Demerara Rum 151 proof as a base of the drink. 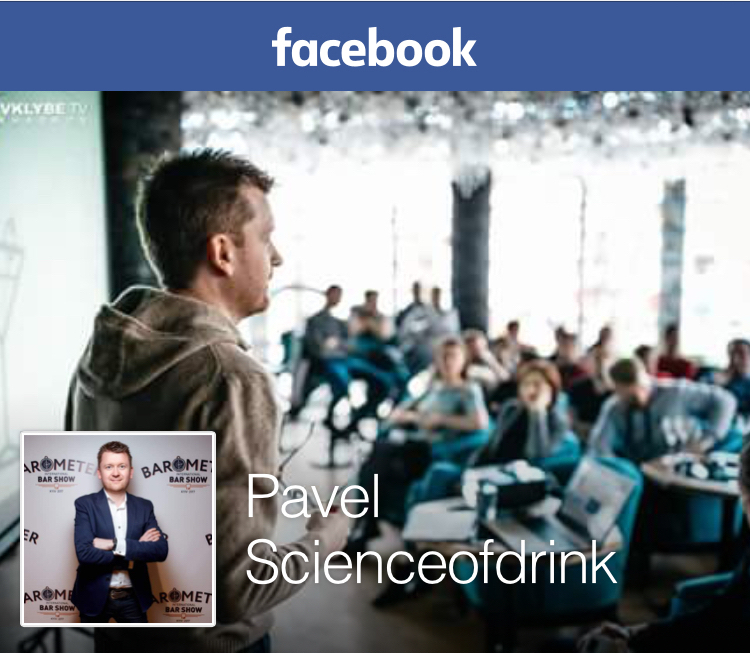 The first trouble – with milk – pertains to modern food technology. I don’t now how it is in the USA, but here in Ukraine some sort of long-term storage milk in the carton is… Hmmm, how can I say this? It isn’t milk, actually. It is like an esculent colloidal solution. Proteins, particularly globulins, minerals, vitamins, supplements, additives, ultrapasteurized, normalized, enriched… Hell on wheels, really… I just don’t belive that it is able to curdle 8) So, newly drown whole milk from a local farmer’s market is the only and the best choice. The second question is separating curdled milk from the drink. Most recommended ways are straining through some layers of cheesecloth [it works but not very well], sifting through a chinois or a jelly-bag [it works not so effectivly, proven! ], and filtering with paper [I used filter paper, it worked exceptionally well. Some people say that paper towels can be employed, but I didn’t test it this way]. Actually, if you couldn’t clarify the punch by straining or sifting, you may allow the mix to settle. But, remember, the punch must be pretty clear before serving. The first sip of the English Punch was a truly intriguing… Suspense… In truth, I had absolutely no idea how it could taste. I had never drunk such a thing before. And the English Milk Punch didn’t let me down! It was an absolutely amazing drink. The first sip really surprised me with an utterly distinguished texture and mouthfeel and a very pleasant and balanced palate. Gorgeous! 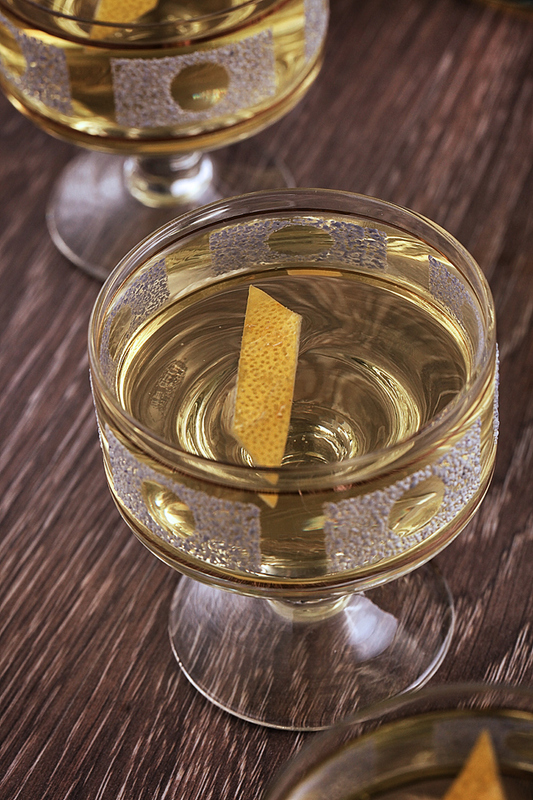 The English Milk punch has a balanced fruity (pineapple, citrus adorned with spices), sweet-and-sour taste with a powerful solid spirits note, I mean, not spirituous but derived from the liquors used. I think, namely that I can describe it as a lush palate. All components work very well in this drink but in my humble opinion the milk whey makes this drink. It brings exceptional softness, roundness in the palate and mouthfeel. 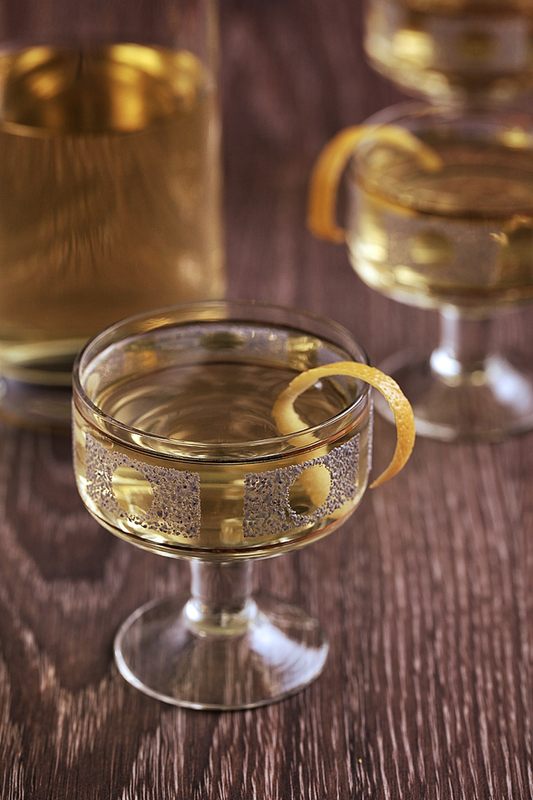 When you drink the English Milk Punch your tongue, gums, all mouth organs feel like they contacting with cold glass, or silk, or some of the smoothest things in the world. It is an amazing feeling! It is worth preparing the drink for the whole day long! 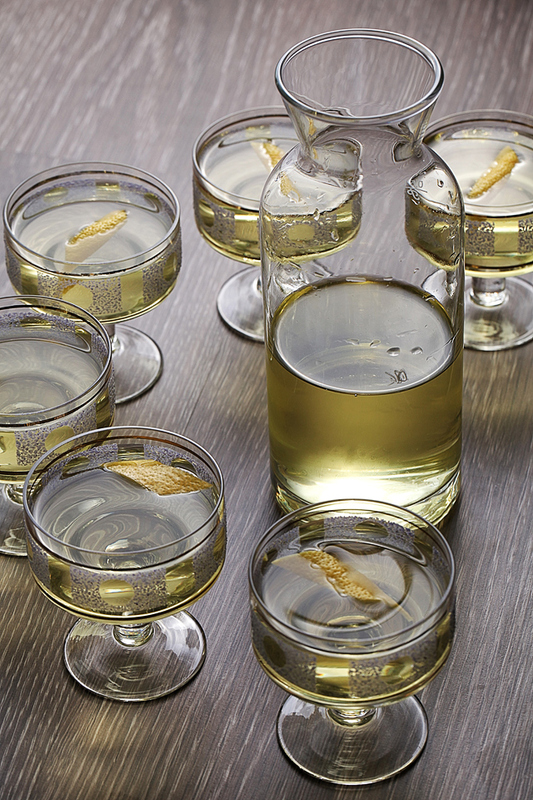 Yet one more thing – some people suggest serving Milk Punch over ice. 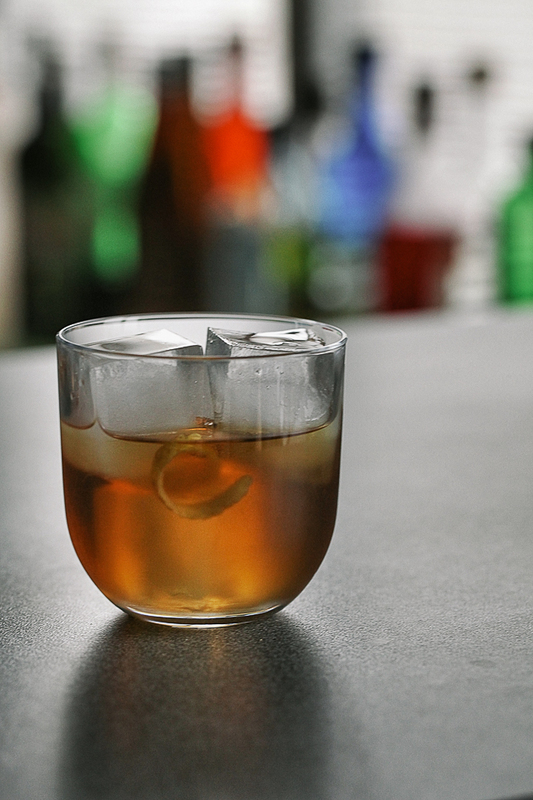 I see this point – ice keeps the drink cold and visually magnifies it, but, it seems, it has not the best affect on the mouthfeel. It makes punch diluted and this can spoil its unique texture. So, I insist, serve it straight up only! 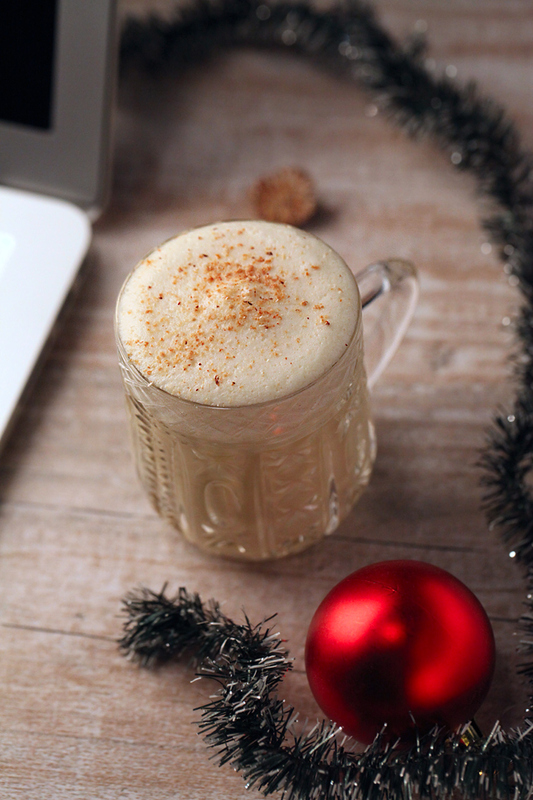 Some days ago I posted about my first sips of a traditional American Christmas drink – Eggnog. In that entry I briefly mentioned that there were two ways to achieve proper texture of eggnog (you should realize, that these two ways give entirely different results). First – maturing – I tried with my first recipe of Uncle Angelo’s Eggnog by Dale DeGroffe (who, actually, as you can see in this video, mixes his famous Uncle Angelo’s Eggnogs in quite original way and without any ripening) and second – cooking I am going to describe here. In a way, it is a philosophical issue – To cook or not to cook [eggnogs]: that is the question! And I see at least two reasons that make people cook their nogs. First – a lot of people are afraid of consuming raw eggs, they are frightened by salmonella, stomach bug and other indigestions. 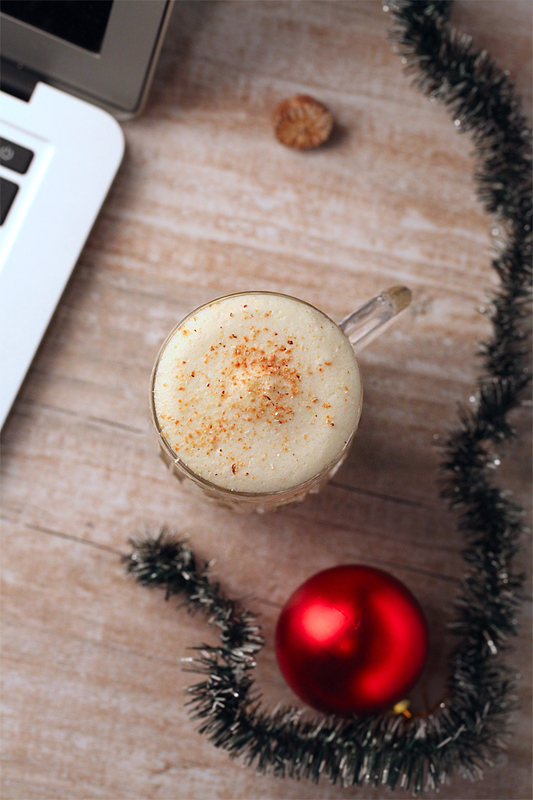 But another reason seems the most important – cooked eggnog is absolutely delicious! Besides, cooking of eggnog allows achieving of a really thick, rich and textural eggnog. 1. In an appropriate sized saucepan pour milk, cream (if you use half and half), add pinch of salt, fresh grounded nutmeg, cinnamon, some whole cloves or another spices and heat the mix till it is steaming (but do not boil! As we all know, boiled milk isn’t that tasty :) Leave warm milk mixture to steep. Before using I prefer to strain the mix through a tea strainer. 2. Separate eggs. Put egg whites in an appropriate airtight container and refrigerate or (if you are going to keep your eggnog relatively long) freeze. 3. Beat yolks in a large bowl until pale than add about three-fourth of the sugar and beat until they become almost white. 4. Pour warm spicy mixture to beaten yolks very slowly. Stir up constantly while you are pouring the milk. 5. Set the mixture on medium (or low) heat and cook it about 10-15 min at 160°F until certain thickening. Don’t let the mix boil! It is very important, because if the mix get boiled, yolks will curdle and the drink will be completely spoiled. 6. If you don’t have a thermometer, you may use a spoon-test for determining of an end point of cooking. Simple dip a metal spoon into the mix and look at – the mix should coat the spoon with a thin smooth film if ready. 7. After cooking let eggnog cool a little and add heavy cream, vanilla extract and bourbon. 8. 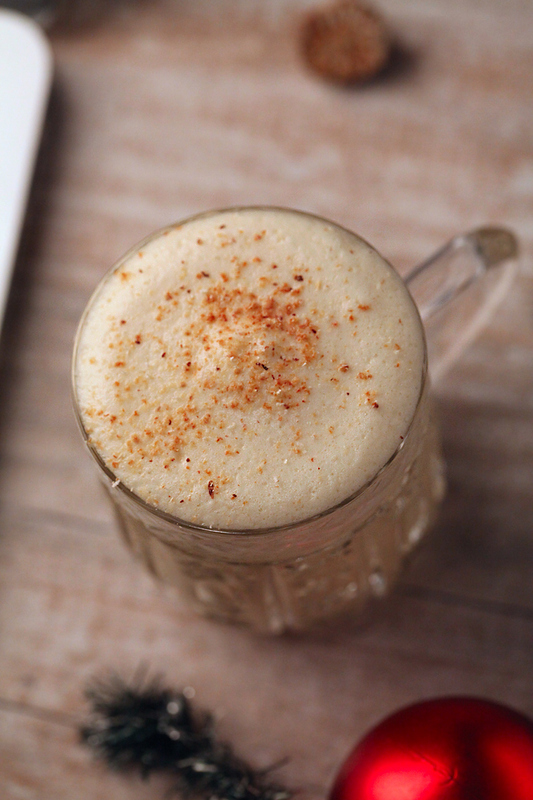 Chill eggnog in a fridge for several hours or overnight. 9. Right before serving beat egg whites (you should thaw they before, of course, and warm up they to room temperature) until soft peaks with the rest of sugar. Do not overbeat, egg whites shouldn’t go past the “glistening” stage. 10. In an appropriate punch bowl gently incorporate beaten egg whites in chilled eggnog using a whisk until completely smooth, thick and fluffy. 11. 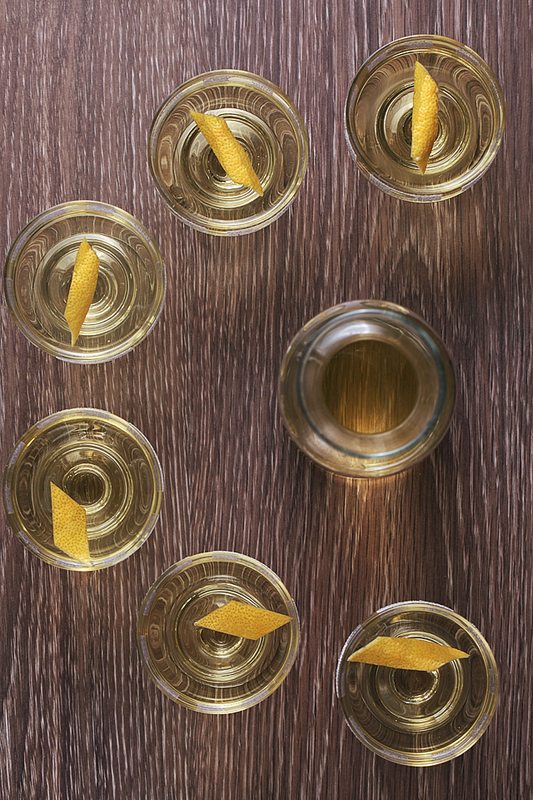 Grate some nutmeg on top of the eggnog if you use a punch bowl, otherwise grate nutmeg on top of each drink. Serve in beautiful punch cups or short tumblers. 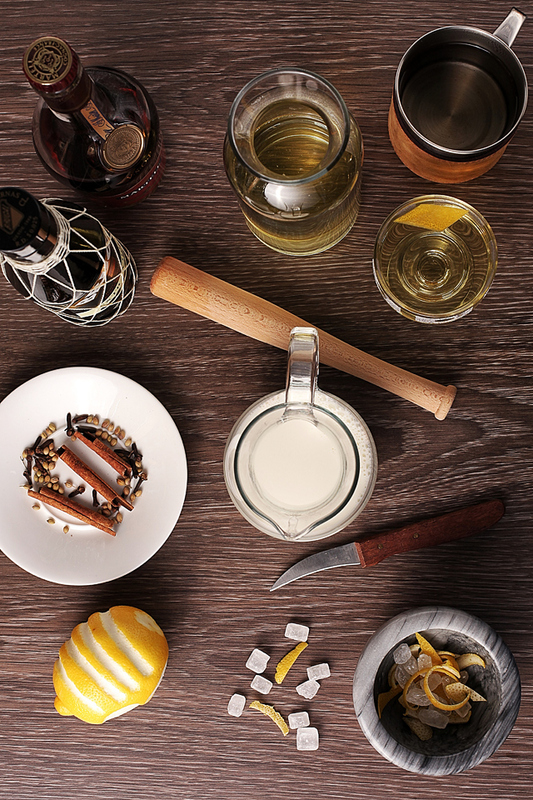 All ingredients are traditional for eggnog and, consequently, may vary. Notice, if you decided to cook your eggnog because you are afraid of salmonella, I recommend using pasteurized eggs or egg whites for serving. The texture of eggnog is quite affected by how fat your dairy is, but you health is too :) Also you can change the amount of sugar if you prefer a not so sweet eggnog, but I am a real sweet tooth. Traditional species for eggnogs are nutmeg (absolutely essential), cinnamon (strongly recommended), cloves (if you want them, I usually do), cardamom (for the eccentric, I want to try it) and vanilla (strictly recommended too). Even though I only specify bourbon in the recipe, rum (specifically dark or spiced) and brandy (cognac) or their mixes are also used. This season I made my cooked eggnogs only with bourbon, specifically Wild Turkey 101, and I was totally satisfied with the results.